Dana Powell of Tampa was sentenced to four months in jail after rioting at the Inauguration Day protest in Washington D.C. that injured six officers and caused tens of thousands of dollars in property damage. According to the U.S. Attorney’s Office, a factual proffer signed by Powell, on January 20, 2017, stated he joined together with more than 200 other people in and around Logan Circle in Washington, D.C. and formed a “black bloc.” Individual defendants wore black or dark colored clothing, gloves, scarves, sunglasses, ski masks, gas masks, goggles, helmets, hoodies, and other face-concealing and face-protecting items to conceal their identities in an effort to prevent law enforcement from being able to identify the individual perpetrators of violence or property damage. Powell was caught on video carrying a black flag, while dressed in all black, with his face partially covered. Throughout the condensed video showing ten minutes of the 30-minute riot, he is seen throwing rocks and bricks at D.C. police officers and storefronts, and even shattering store windows along the 16-block walk. Assistant U.S. Attorney Jennifer Kerkhoff called Powell a “violent coward” and “among the most violent” of the defendants that participated in the riot. He was armed with a gas mask, a facial mask to hide his identity, a hammer, and a heavy wooden stick with a flag attached to it. “He initiated violence,” Kerkhoff said. “He came to the District of Columbia to engage in violence by hiding his face, throwing rocks and running. Powell’s attorney, Ashley Jones, told the court Powell intended to protest peacefully. She also shifted part of the blame to police officers for inciting violence, saying that at times the protesters were responding to the actions of the police. Authorities report 234 people were arrested and accused of rioting. Of those, 198 cases are pending. WASHINGTON – Dane Powell, 31, of Tampa, Fla., pled guilty today to charges of felony rioting and felony assault on a police officer for his role in the violence and destruction that took place in downtown Washington on Inauguration Day, announced U.S. Attorney Channing D. Phillips and Peter Newsham, Acting Chief of the Metropolitan Police Department (MPD). Powell was among more than 230 people arrested in the aftermath of various incidents on January 20, 2017; he was arrested the following day. He was among 212 defendants named in a superseding indictment returned on April 27, 2017, by a grand jury in the Superior Court of the District of Columbia. Powell is the first to plead guilty to felony charges. In his guilty plea, Powell admitted to breaking windows and throwing a brick, large rock, or piece of concrete at uniformed law enforcement officers. He admitted being part of a group of rioters who moved approximately 16 blocks over a period of more than 30 minutes. The charge of inciting or urging a riot (felony rioting) carries a statutory maximum of 10 years in prison and a $25,000 fine, or both. The charge of assaulting a police officer also carries a statutory maximum of 10 years in prison and a $25,000 fine, or both. Under the District of Columbia’s voluntary sentencing guidelines, Powell faces an estimated range of 12 to 36 months in prison on each of the two charges. Powell, who remains free on personal recognizance, is to be sentenced on July 7, 2017 by the Honorable Lynn Leibovitz. According to a factual proffer signed by the defendant, on January 20, 2017, Powell joined together with more than 200 other people in and around Logan Circle in Washington, D.C. 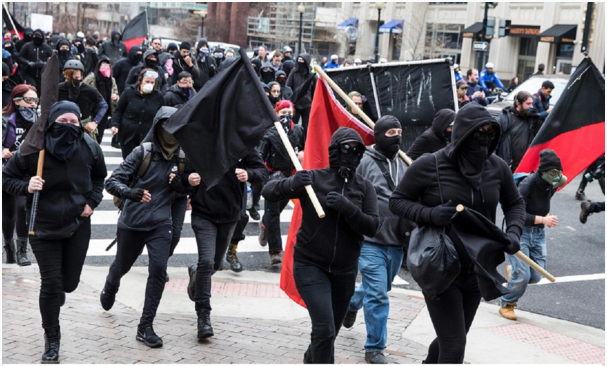 The group formed a “black bloc” in which individual defendants wore black or dark colored clothing, gloves, scarves, sunglasses, ski masks, gas masks, goggles, helmets, hoodies, and other face-concealing and face-protecting items to conceal their identities in an effort to prevent law enforcement from being able to identify the individual perpetrators of violence or property damage. Some of the members of the black bloc were armed with hammers, crowbars, wooden sticks, and other weapons. Powell was among those dressed in black, and had in his possession a gas mask. Powell also attempted to conceal his face with a mask. Powell was in possession of a hammer, and a heavy wooden stick with a flag attached to it. At or about 10:19 a.m., according to the proffer, Powell and others in the black bloc moved south from Logan Circle on 13th Street NW. He marched with the group and saw that, within minutes of leaving Logan Circle, individuals participating in the black bloc began to vandalize and damage public and private property. At approximately 10:35 a.m., Powell and other participants — who armed themselves with hammers, crowbars, wooden sticks, and other weapons — broke the windows of a Starbucks coffee shop in the 1200 block of I Street NW, the proffer states. He continued to move with the black bloc for several blocks when, at approximately 10:40 a.m., he broke the windows of a McDonalds restaurant near the intersection of New York Avenue NW and 13th Street NW, Washington, D.C. He then continued to move with the black bloc for multiple blocks. At approximately 10:50 a.m., according to the proffer, Powell and more than 200 participants in the black bloc observed law enforcement forming a police line consisting of less than two dozen officers at the intersection of 12th and L Streets NW. At approximately 10:52 a.m., he and the other participants formed their own line, counted down, and charged the officers who formed the police line. Powell was one of approximately 50 or more individuals in the black bloc who broke the police line and was able to escape. Law enforcement was ultimately able to detain and to arrest more than 200 participants in the black bloc, and those individuals were held at the intersection of 12th and L Streets until they could be processed for arrest. After Powell broke the police line and while law enforcement was detaining the more than 200 participants in the black bloc at the intersection of 12th and L Streets NW, he and others continued to engage in violence, the proffer states. Law enforcement formed another police line at 12th and K Streets NW. On at least three separate occasions, Powell threw a brick, large rock, or piece of concrete at uniformed law enforcement officers who had formed a line, the proffer states. Others also threw bricks, rocks, or pieces of concrete at uniformed law enforcement officers in the area. Multiple officers were transported to the hospital after being hit with bricks, rocks, or pieces of concrete, to include one officer who was knocked unconscious on the scene. The investigation is continuing, and three defendants were added to the case in the superseding indictment returned on April 27. The U.S. Attorney’s Office has dismissed cases against 19 of the 230 individuals arrested on Inauguration Day. Two other defendants have pled guilty to a misdemeanor rioting charge. This case is being investigated by the Metropolitan Police Department and the U.S. Attorney’s Office for the District of Columbia. It is being prosecuted by Assistant U.S. Attorneys Jennifer A. Kerkhoff and John W. Borchert.